Mass Media, Mass Propaganda analyzes a wide range of issues, domestic and international, concerning American and global news coverage of the U.S. "War on Terror." Topics reviewed include: media coverage of the invasion and occupation of Iraq, the proliferation of weapons of mass destruction, Iraqi civil war and resistance to occupation, September 11th and "Operation Enduring Freedom" in Afghanistan, human rights violations in Iraqm domestic anti-way dissent and censorship, and potential future targets in the "War on Terror." This work approaches the study of media through a political economy analysis, examining the ways in which the American corporate media works to reinforce official views and propaganda, and the ways in which it challenges official pro-war platforms. A comparative approach is taken in contrasting the American mass media with other media institutions from the Progressive-Left American press, the British and Australian press, and Arab electronic media. Anthony DiMaggio is assistant professor of politics and government at Illinois State University. Chapter 2 Introduction: Understanding the News in the "War on Terror"
Chapter 3 1 Public Trust, Media, and the "War on Terror"
Chapter 13 11 A Game Plan for Infinite War? Lucidly written and broadly researched, DiMaggio's book is an excellent exposé of how mainstream media use conceptual evasion and informational manipulation to serve the empire. Mass Media, Mass Propaganda is a superb contribution to the literature on media coverage of the current war in Afghanistan and Iraq. Anthony DiMaggio's thorough analysis is unparalleled in any other work I have seen. This book is a must read for anyone interested in the media. The author's plea for a democratic media is well placed after a thorough analysis of how the media in this country has failed in its responsibilities toward its consumers. DiMaggio's Mass Media, Mass Propaganda is a much needed text documenting the increasing evidence that corporate media is fully embedded with the Global Dominance Group of the US military industrial complex. His message is a significant addition to the overwhelming evidence for corporate media's complicity in war and its full service as a propaganda machine for the powerful. For political journalists, journalism faculty and students, and common readers who believe the news media should present a more diverse spectrum of views about the defining political issues of our era, Mass Media, Mass Propaganda is a must-read book. It is an abundantly researched yet bound to be controversial study. DiMaggio writes in a style addressing both general readers and academic scholars. The book is animated by passionate advocacy of alternative media and of general media reform. 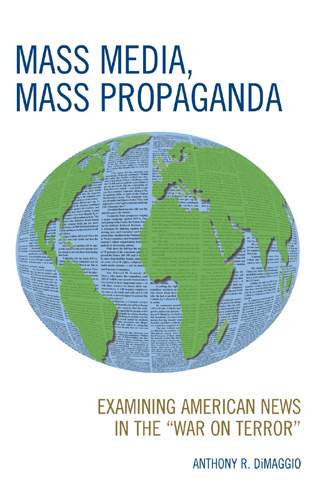 Mass Media, Mass Propaganda delivers a courageous critical analysis of the practice of news today and its impact on democratic public opinion. DiMaggio's careful development of journalistic evidence builds a strong case. If history ever judges the folly of our times, it will not pass lightly over the complicity of our media in our disasterous Wars of Error so carefully detailed and documented with adroit scholarship by Anthony DiMaggio. His book will drive many journalists to hang our heads in shame and seek atonement through more thoughtful and critical work. This is a brave and important book by one conscience of academe. It could be cited on the tombstone of irresponsible corporate media. Major models analyzed and evaluated throughout this work include the "Propaganda Model," developed by Noam Chomsky and Edward Herman, and the "Indexing Model," elaborated upon by scholars such as W. Lance Bennett, Steven Livingston, and Jonathan Mermin.